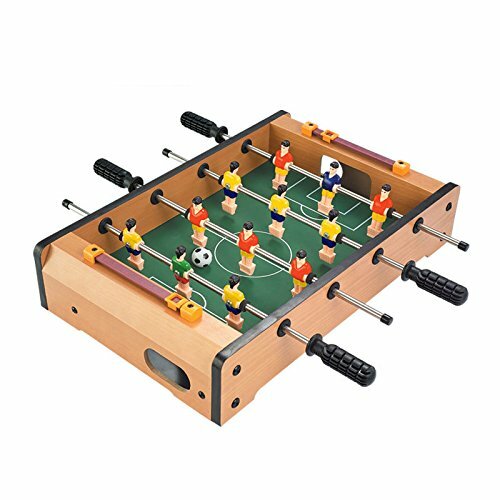 JFA 14 Inch Soccer Table Football Board Game Kids Toy Family Party Games Wood Toy Portable Travel Tabletop Football Set by JFA at Wander Soul. Hurry! Limited time offer. Offer valid only while supplies last. DETAILS: The action packed table top game that strategically pits team-against-team, offense-against-defence. In a fast placed scramble to score. TAKE WITH YOU ANYWHERE- This portable miniature table football set is the ideal space saving size and is perfect for places or homes where there is no room for a full-sized foosball table, like the kid's playroom or the family room floor.
. Comes with 2 soccer balls. Some assembly required- includes Allen wrench. Game features 4 rows of 3 players (2 rows for each team). If you have any questions about this product by JFA, contact us by completing and submitting the form below. If you are looking for a specif part number, please include it with your message.